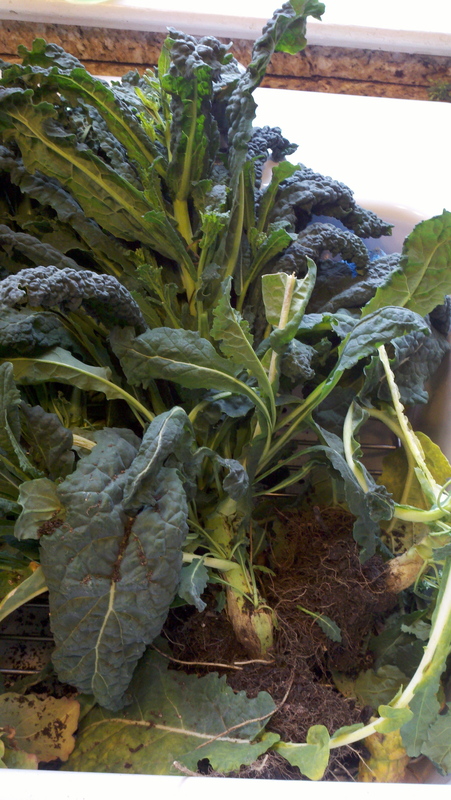 I’d posted recently that my dinosaur kale was nearly done….there were still four more plants left in the raised beds. 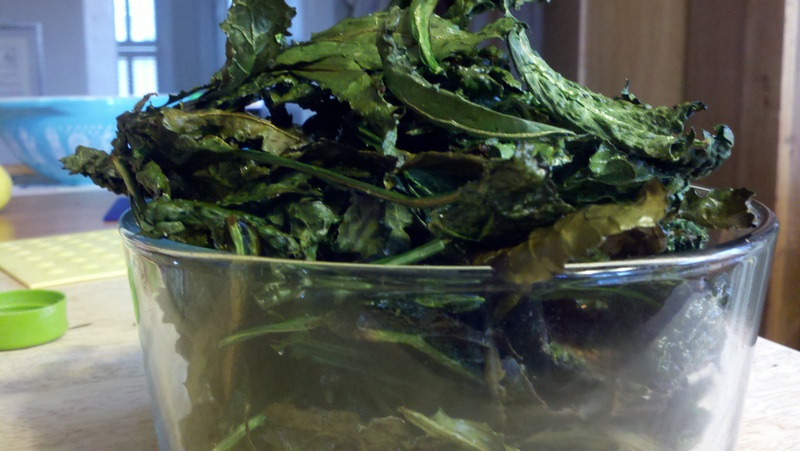 Fortunately, the article that my neighbor gave me included a recipe for kale chips. 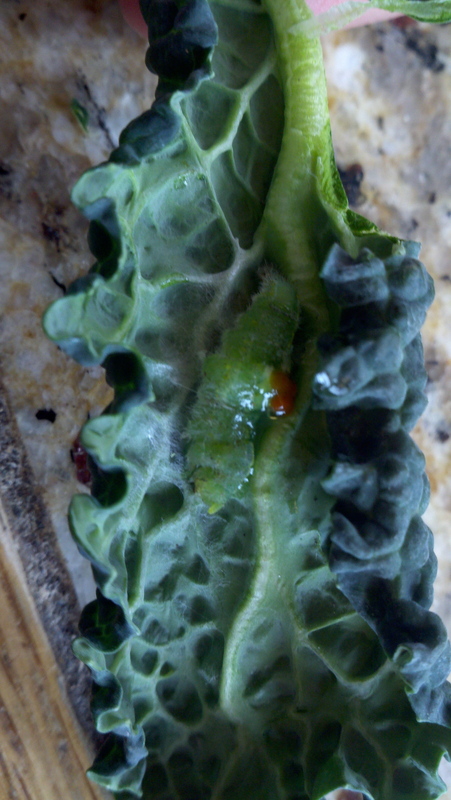 The recipe itself was fairly easy: put kale leaves in single layer on cookie sheet, spray with canola oil, sprinkle with salt and garlic powder, bake at 350 for 15 minutes, turning once. The prep was fairly labor-intensive: washing all the leaves, removing the leaves off the main stem, then tearing the thicker stems off. Since the plants were about to bolt, the leaves were smaller than usual, so there were alot to tear off, and I also had to do alot of flipping mid-bake, I did about 8 batches (2 cookie sheets at a time). I had tried to enlist my older boy to help me rip the leaves from the stems, but he was more interested in playing with the cabbage worm we found. I saw some of the adult white moths flitting around the garden last week and figured they were laying eggs somewhere. They work fast — it hasn’t been warm that long! Salty, garlicky, thin, crunchy and good! By coincidence, I saw a woman picking up a package of them on the chips aisle today at Greenlife….it looked like those weren’t made from dinosaur kale but a curly kale variety….I still have one curly kale plant left, may try to make chips from that one next. One of the other recipes was for a watercress and barley salad. I still have a ton of watercress, so I was glad to see a recipe that called for 3 cups of watercress. 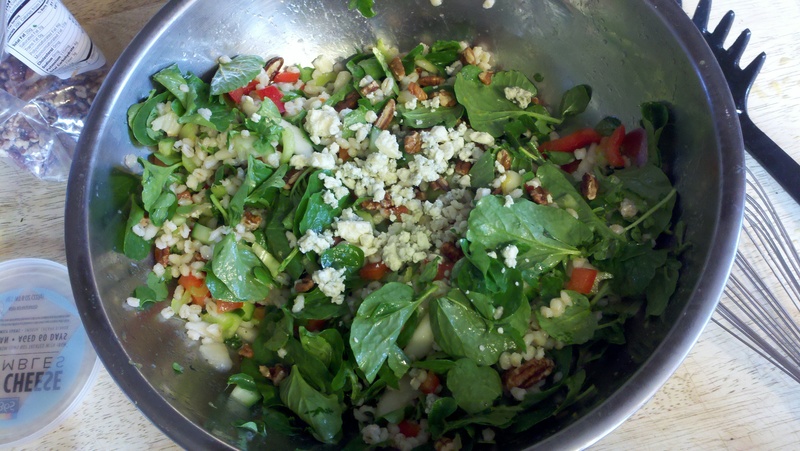 The other ingredients were: cooked barley, celery, red bell pepper, and pear; the dressing was fresh OJ, olive oil and apple cider vinegar; on top, pecans and blue cheese crumbles. I figured since I have so much watercress, why not double the recipe? I think I made enough to feed 20 people. (My husband has dubbed this my “portion control problem” — I’m notorious for doubling and tripling recipes, thinking that the original recipes can’t possibly be enough food). Despite the mountainous proportions, it is delicious — fresh and light, plus the article sings the praises of all the health benefits of eating watercress. We will be very healthy as we have enough to last all week (and share with our neighbors too). The cress is sturdy enough that it didn’t get soggy like most lettuce does once it’s been mixed in a salad and tossed with dressing. Man, forget being a web designer. Should become a food stylist! I would be tempted to wash and dry the whole leaf, but do the prep and bake without tearing into smaller pieces. (I’m kind of interested to find out what would happen to the stalk during baking.) Or cut instead of tearing. In any event, it sounds yummy! I’m glad you tried the recipes and made extra! We loved the salad and kale chips! So delicious! Thanks for sharing!